Below is an excerpt from a post entitled “We came, We saw, We destroyed, We forgot” by William Blum. Attempted to overthrow more than 50 governments, most of which were democratically-elected. 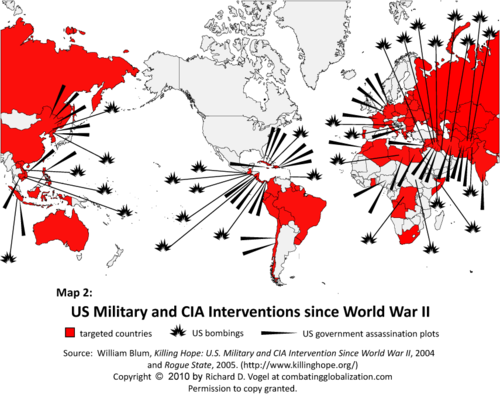 In total: Since 1945, the United States has carried out one or more of the above actions, on one or more occasions, in 69 countries (more than one-third of the countries of the world! If you’re American and wonder why the rest of the world hates your guts, why Jihadists are out there after you, or why your government is despised, you better read more about this issue. It's mind boggling the exterior policies that the USA runs with! Is there anything they won't do to keep their political and military superiority!